East Bengal's Jaime Colado strike gets the job done against Indian Arrows! Home / Indian Football / I-League / East Bengal’s Jaime Colado strike gets the job done against Indian Arrows! East Bengal’s Jaime Colado strike gets the job done against Indian Arrows! A Jaime Santos Colado strike in the second half was enough to get the job done for East Bengal against Indian Arrows at the Saltlake Stadium as the ‘Red & Golds’ climbed to second on the table after 12 games, five shy of leaders Chennai City FC. The Indian Arrows will remain at eighth position with 13 points after an equal number of games. East Bengal’s Spanish coach Alejandro Menendez Garcia made two changes to the starting eleven from their previous game against Chennai Cuty FC. 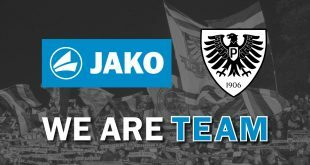 Regular Lalrindika Ralte was suspended and Kamalpreet got a start while Samad Ali Mallick sat on the bench as Lalramchullova came back in after suspension. The Indian Arrows coach Floyd Pinto fielded an unchanged side from their thumping 3-0 victory against Shillong Lajong FC in their previous game. Santos it was, who had the first shot at goal in the 12th minute of the game when he latched onto a second ball and fired only for it to be way off the mark. He then fed Joby Justin from the right flank but the premiere East Bengal striker’s header was well collected by Prabhsukhan Gill in the Arrows goal. 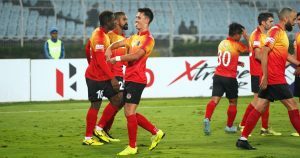 The closest East Bengal came to scoring in the half, however, was when Frenchman Kassim Aidara’s scorcher from 20-25 yards out off a loose ball which resulted off a Chullova throw inside the box, hit the right upright and came back. The ball seemed to have been intercepted by the Indian Arrows defence, but they fumbled and Santos lurking around, pounced on the opening and blasted it into the net. The Indian Arrows then had a couple of chances threw Rahul KP but the closest he came was the side-netting in the 81st minute. In the 84th minute, Joby again found Santos with a cross after darting inside the box with a fine-run, but the Spaniard could not connect for a tap home. Previous VIDEO: Jamshedpur FC assistant coach Guillermo Fernandez speaks on JFC Reserves game! Next South United FC announce 14 new signings ahead of Second Division League!